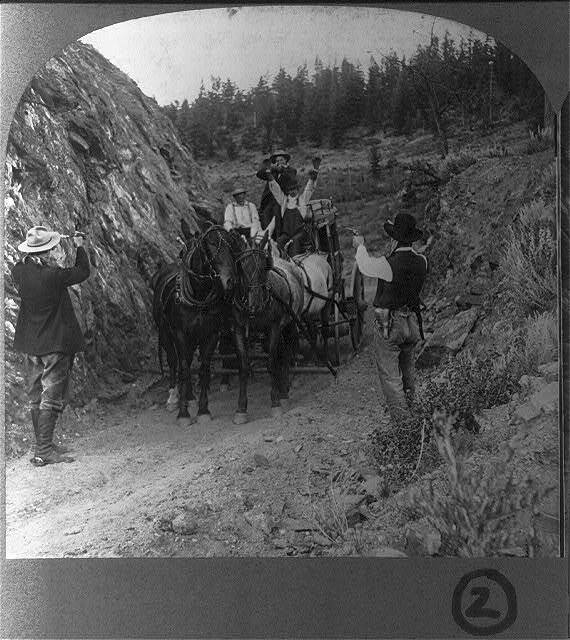 Depiction of a stagecoach robbery in a photo taken around 1911. F.J. Leach, driver for the Western Stage Company, was making his way from Corydon to Centerville on May 6, 1865, with several U.S. mail bags and six passengers aboard. Some had paid fare to Promise City, others to Centerville. Six riders meant the inside of the coach was a little crowded, so one rode outside next to F.J. The Burlington Weekly Hawk-Eye and the Davenport Daily Gazette gave accounts of the events surrounding the robbery. As the coach rounded the bridge at Walnut Creek, nine miles west of Centerville, the passenger on the driver’s box pulled out a revolver and jabbed it into the left breast of F.J.
“Hold on there. You have gone far enough. You are in the hands of the rebels, and I will put a hole right through you if you don’t stop!” he snarled at F.J.
As F.J. turned around to the other passengers inside the coach, he came face to face with five more guns. At this point he realized he had few options. He pulled his team to the side of the road. As some of the armed men unhitched the horses and tied them to nearby trees, others pulled out the mail bags. They slit the bags open with knives. They stuffed some into their pockets and opened others, taking any money they found. When the bandits saw another wagon approaching from the direction of Centerville, they rode over the bridge to greet the newcomers. It was Mr. A. Sagger and his son from Promise City. The robbers brought the pair over the bridge, unhitched, and unharnessed their horses and demanded money from the pair. The elder didn’t have any, but his son was carrying $30. The gunmen took $25 and gave $5 back. The bandits decided to wait for a stage they knew was scheduled to pass shortly. They weren’t disappointed. After about 20 minutes, the west bound stage approached. Four of the robbers set out and brought the stage over the bridge. They repeated their previous actions, unharnessing the horses and rifling through the mail bags. George Pratt, an agent for the Western Stage Company, offered a $50 reward for the arrest of the gang of bandits. The victims of the robbery were able to provide quite detailed descriptions of four of the men. One was a tall fellow with shingled short hair and without whiskers, wearing gaiter shoes and a cloth cap. Another was heavily built with a very red face and a light growth of facial hair. He was wearing an overcoat of heavy corded fabric, made in the style of a soldier’s overcoat with large black buttons. A third man was tall, with dark whiskers and a dark complexion. And another was a small man with blue eyes and bushy, curly hair covered with a light colored hat. And there were very detailed descriptions of the stolen horses. One was recognizable by its hips, rubbed free of hair by the breeching. Two bays, one with a star on its forehead and the other with a light hind foot, had been taken. Another suffered from sore eyes, and its hind foot had a swollen joint. There were two roans, one about 10 years old and the other eight. Lawmen from three neighboring counties were notified. Armed deputies from Appanoose, Wayne and Decatur counties were in armed pursuit of the bandits, who had also stopped to steal saddles from a couple of houses as they fled from the stagecoach robberies. Bold Mail Robbery in Iowa,” Burlington Weekly Hawk-Eye, May 6, 1865. “More About the Mail Robbers,” Davenport Daily Gazette, May 19, 1865. The Secret Service said it was his “unusually inquisitive” nature about military matters that tipped off personnel about a German man working as a waiter in the officers’ mess at Camp Dodge, according to the Des Moines Register in 1917. John Conrad Ebert, 24, was arrested by federal agents on Saturday, November 24, 1917, at the camp. I love this story and history. I’ll mention your work and this story in a presentation for our historical society here in Waverly, IA. I will receive no payment for my presentation and will credit you thoroughly. Please tell me if that will be all right. Yes, spread the story. Be sure to credit Cheryl Mullenbach for her work and IowaWatch for sharing it with you. 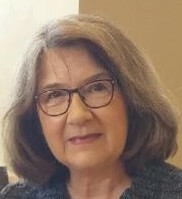 And, watch for Cheryl’s column every week at IowaWatch.org. Thanks for your interests.